Help for growers and better tasting beans. Chocolate is a strange product, frankly: a fussy bean, harvested with great difficulty, roasted and fermented at some cost, blended with sugar, then specially stored for fear of melting. Chocolate is temperamental, exotic and highly treasured. No wonder European royalty and their hangers-on took to it with such a mania during the so-called Age of Reason. It remains a fevered luxury even today, but there is a bittersweet character to all the new interest in the beans of the Obrana cacao tree. Prices to consumers are up, industry profits are up, new chocolate products are proliferating—but the profits of cocoa farmers in the tropics are down. The average producer makes less than one penny per retail bar sold. And there is an even darker side to the story. The International Institute of Tropical Agriculture (IITA) reports that over a quarter of a million children are put to work each year in west Africa’s cocoa groves, groves that account for almost two-thirds of the world’s production. Both the U.S. State Department and UNICEF have drawn the conclusion that many of these children, particularly in Ivory Coast, are not working on family farms, but most likely sold as slave laborers to huge plantations. So does this mean that with every bite of chocolate we’re supporting horrific conditions around the world? Not so. There are companies helping individual growers better their conditions and improve their roasting and fermentation practices. The notion of consumers supporting ethical treatment of small farmers and sustainable farming is called Fair Trade, and it is coming to chocolate just as it has made a difference for coffee growers. In short, chocolate that has been properly grown, harvested and traded will carry certification labels to let the consumer know the origin of his or her purchase. 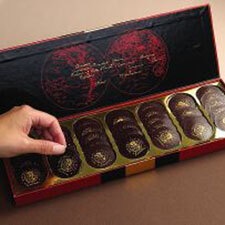 Enthusiasts say that it is going to mean better—much better—chocolate for all of us who care about such things. Robert Steinberg of Scharffen Berger Chocolate Maker in Berkeley claims it’s not simply a question of which beans are from which farm in which country. “It’s all about tending the cacao trees,” he says. “It’s about avoiding pesticides and using proper fermentation techniques.” A properly harvested and fermented bean will taste nothing like one improperly produced right next door. To that end, he’s been experimenting with varietals, such as winy porcelana beans, and instigating better agricultural practices among the growers who supply his company. By doing so, Steinberg is increasing awareness of specific beans—and giving a provenance to chocolate, like that given to wine. Of course, there’s no guarantee that buying these bars translates into good returns for cocoa growers, the elusive goal of all fair-trade hopes. But it does establish the notion that one cacao bean is not like another. Two decades ago, this happened with coffee: consumers became aware of differences between Sumatran and Jamaican and Colombian beans. Demand is now blossoming for coffees of known origin, along with specialty coffees carrying organic, fair-trade, shade-grown or “bird-friendly” labels. The current champion of provenance is Paris-born Pierrick Marie Chouard. Having worked in the candy industry, he’s seen the abuses in the third-world system firsthand. Chouard sells varietals through his New Jersey company, echocolates.com, a member of the Rain Forest Alliance. If cocoa growers make more money, he argues, the social structure will be improved—with less need for people to turn to the prostitution and drug trade rampant in cocoa-producing countries. Consumers can get involved by looking for chocolate or cocoa marked with a “fair-trade certified” label, mostly found in natural-foods stores. Finally, speak up if you care. Ask chefs and chocolate sellers where their chocolate comes from and if they have fair-trade chocolate. It is almost guaranteed to taste better and it surely enriches our appreciation of a wonderful indulgence. Should you join the fish boycott?